Six people were hospitalized and hundreds of firefighters deployed to fight a hydrocarbon fire following an explosion at a plant in southern China that produces the toxic chemical paraxylene, officials said Tuesday. 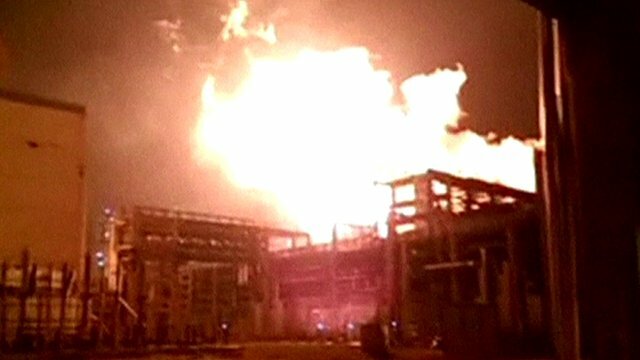 Authorities said there were no leaks from the plant’s three tanks of burning hydrocarbon liquids and no signs of contamination of the environment following the blast Monday evening at Goure PX Plant in Zhangzhou, Fujian province – the second explosion to hit the factory in 20 months. Concerns over the safety of plants that make paraxylene, or PX, a chemical used for producing fibers and plastics, have prompted several protests in China in recent years. Exposure to the chemical can cause eye, nose and throat irritation. Zhangzhou Deputy Mayor Zhang Yiteng told reporters that one person was injured at the blast site and five hurt by broken glass. The official Xinhua news agency said strong tremors were felt up to 50 kilometers (30 miles) away. Authorities deployed 177 fire trucks and 829 firefighters to fight the blaze and all nearby residents were evacuated, Zhang said. The fire was under control, and authorities were monitoring the environment for any contamination, Zhang said. Several other cities around China have seen similar protests.